As world populations continue to age, the incidence of very common, ultimately fatal neurodegenerative diseases (some of medicine’s most puzzling illnesses) will increase exponentially. 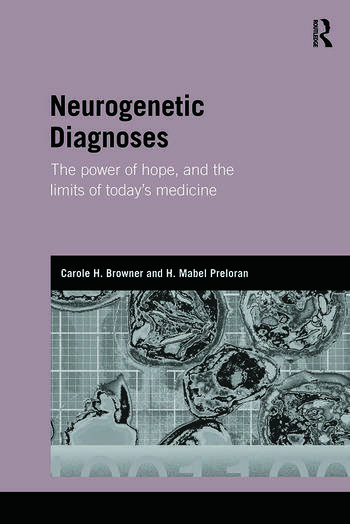 Neurogenetic Diagnoses, the Power of Hope, and the Limits of Today’s Medicine explores the diverse impacts and intense meanings of genetic diagnoses for patients suffering from such diseases, and for their family caregivers and clinicians. Through richly-textured, often heart-wrenching longitudinal case studies, Neurogenetic Diagnoses... reveals how extremely difficult it can be for patients to obtain a definitive diagnosis for the cause of their symptoms, even with genetic testing; how, with or without definitive diagnoses, patients and family caregivers strive to come to terms with their situations; and how they are aided (or not) in these endeavors by their doctors. The analysis is framed by increasingly sharp social debate over the consequences of decoding the human genome -- and the impact of genetic technology on our lives. Carole H. Browner is Professor in the Department of Anthropology, the Department of Womens Studies, and the Center for Culture and Health, which is based at UCLA's David Geffen School of Medicine NPI-Semel Institute for Neuroscience and Human Behavior, USA. She is also editor of the collection, Reproduction, Globalization and the State: New Theoretical and Ethnographic Perspectives (Duke University Press, 2010). H. Mabel Preloran has over 25 years experience as a cultural anthropologist in the US and in Latin America. She is a Research Anthropologist in UCLA’s David Geffen School of Medicine NPI-Semel Institute for Neuroscience and Human Behavior, USA. Her current research focuses on the use of genetic testing in neurology.